When will the ice boom come out? The short answer is not for a while. The ice boom is required to be removed from the head of the Niagara River by April 1 each year unless ice covers more than 650 square kilometres of the east end of Lake Erie. 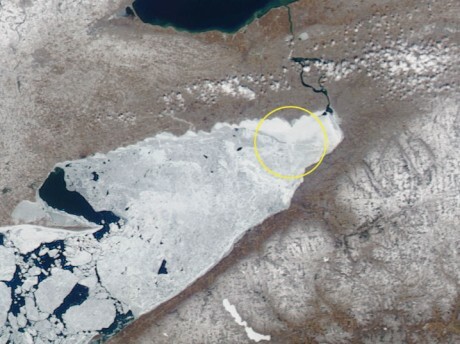 The yellow circle represents an area approximately 650 sq. km. and is just a small portion of area from Long Point in the west (left) to the river in the east still socked in with ice. Point Abino is located at the centre of the circle and the left edge is near Port Colborne. The ice boom itself can be seen as a thin short strip bridging the gap of water at the riverhead. Click on the picture to see it larger. The picture was taken by satellite Friday afternoon. Interesting features of ridges can be seen as well as snow cover in the hills to the south and east of Fort Erie as well as pretty little clouds across central Niagara to Grand Island — the famous Netherby Road weather strip.